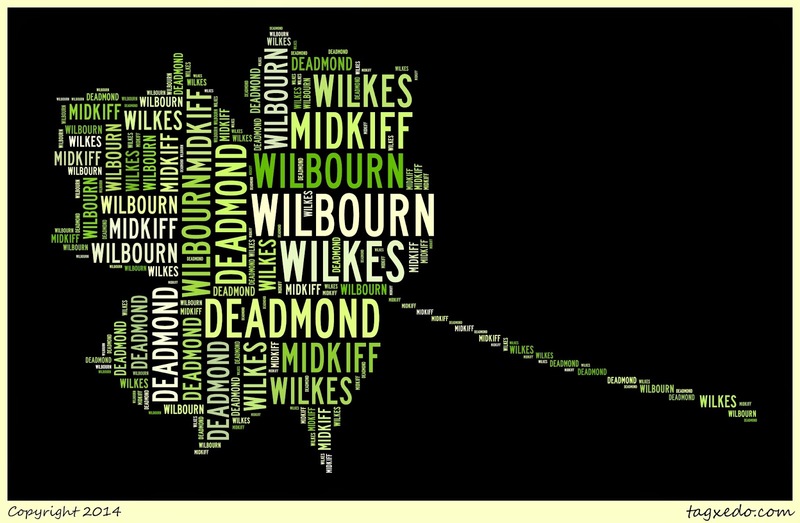 WILBOURN is my children's father's Great-grandmother MIDKIFF's maiden name. Alternative spellings include WILBORN and WILBURN. There is not a lot of known history (at this point) on this surname, although I've been able to find quite a bit of genealogy on female lines that marry into this family. It also has what is a unique-- at least to me--migration pattern from the Eastern U.S. to the Midwest to the Southwest and then West. Ahnentafel #68 - William WILBOURN, Sr. (b. 1770) - born in Orange Co., North Carolina, he married Mary WILKES (1770 - bef 1840) by 1799. They had at least ten known children. The oldest child's information is unknown; the second child was born in Virginia, and the third child was born in Campbell Co., Virginia. The youngest seven children were all born in Orange Co., North Carolina, like their father. It's not known exactly when or where William died; his youngest child was born in 1821 in Orange County, and Mary died before 1840 in Marion Co., Illinois. Many, if not all of their surviving children migrated to Marion County (three were married in that county in 1831), and some of them in turn, migrated to Cooke Co., Texas. Ahnentafel #34 - Dr. John Wilks WILBOURN (1809 - 1878) - born in Orange Co., North Carolina, he married Martha Susan DEADMOND (1813 - 1906) on 6 Oct 1831 in Marion Co., Illinois. They had nine children; the oldest six were born in Illinois, the youngest three in Texas (probably Grayson County). By 1850, Dr. WILBOURN had set up practice in Grayson Co., and in 1860 he is found specifically in Sherman Township. In 1870, he is found in neighboring Gainsville, Cooke Co., Texas. He died 12 Mar 1878 in Cooke Co., and his body was sent to Fulton Co., Illinois for burial. After his death, many of his children and grandchildren migrated west to Butte Co., California. The January 2011 Scanfest will take place here at AnceStories next Sunday, January 30th, from 11 AM to 2 PM, Pacific Standard Time. Hard to believe, but today marks the fifth anniversary that I began writing this blog, over at the Bravenet Journal platform. I later switched to Blogger and transferred all my early posts over. My first post was Moses Crothers - possible son of John Crothers and Mary "Polly" Wyckoff? I haven't yet proved Moses was John and Mary's son, but in the past five years I've met some amazing people, online and off, because of this blog. I've added to my family tree from research I've written about here or from relatives stumbling across this blog after a Googling a common ancestor. I've been featured twice in the local paper and had Google Books send a film crew to my home to make a video highlighting how I use Google Books in genealogy...all thanks to this blog and to my wonderful readers. I've had ups and downs with blogging and even though right now is kind of a quiet time again for AnceStories, I appreciate those who faithfully and patiently stick with me and wait for my next post. So enjoy a piece of virtual cake and celebrate with me! Here's to all of you! Elyse Doerflinger is a rising young genealogist with a speciality in organization and technology. She is the author of Elyse’s Genealogy Blog, where she shares her knowledge and family history. Her love of sharing knowledge with others has inspired her to write for lecture for various genealogy societies and write for genealogy magazines. Connect with her through email, Facebook, or Twitter!